The blind are far from a monolithic group. There are those who are congenitally blind, meaning they had no eye sight at birth, and then there are those who became blind later in life. 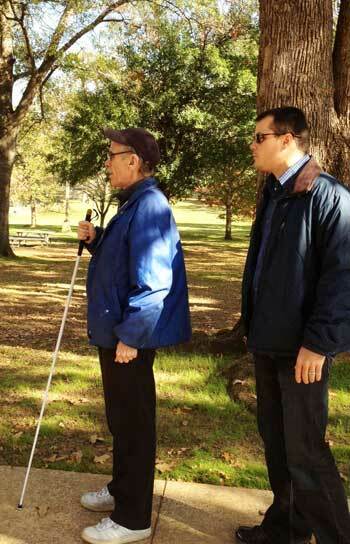 These two categories of blind people may navigate the built environment a bit differently. Describing a very small study of how congenitally-blind and late-blind people navigate a shopping district and an urban park in Izmir, Turkey, Fehmi Dogan, professor of architecture at the Izmir Institute of Technology, presented some interesting observations at the Environmental Design Research Association (EDRA) conference in Los Angeles. Of the seven participants (4 men and 3 women), the mean age was 28. Each uses a white cane or “eye stick” to get around. “They all have a self-sustaining life and are good travelers,” added Dogan. Each participant was sent through a set of trials for 6 hours, walking a 900-meter-path either through a busy commercial district or a park, each with a range of obstacles to confront. Researchers walked the paths with them the first go-around and then they walked it again alone and were asked to describe important reference points, including whether they used their memory or a sense (touch, smell, or hearing) to navigate. These reference points, which totaled in the hundreds, were then examined in greater detail. Dogan emphasized that this study is in “no way generalizable or conclusive,” but merely observational. In the shopping district, the congenitally blind were especially attuned to all the sensory experiences on the course. Even the congenitally blind can see light and dark. “They followed the echo of the sun.” They also closely read air movements, so they could sense when they had reached a crosswalk or intersection because the air flow changed. Dogan read from some of the blind participants’ own references. The sound of high heels clicking on a sidewalk helped one subject orient themselves. They used echos to identify the streets on three sides. Another listened for the time it took for a bird to leave the ground and alight on a building roof, which allowed them to calculate the roof’s height. And among the congenitally blind, the sense of smell was most used. They were able to plot themselves based on the smell of coffee, corn, even new clothes. However, smell can easily change with air movement. Next Article What Dose of Nature Do We Need to Feel Better?